Manitou Gold Inc. reports that final assay results from the preliminary surface bulk sample conducted at its Kenwest property have definite continuous surface mineralization. The company’s 100% owned Kenwest property is situated about 50 km South of Dryden, Ontario. Manitou finished its initial program of blasting and sampling along the #2 shear zone in late November 2017. A total of 12 dry tons of rock material were sampled and transported to SGS Lakefield laboratories. Six blasts were carried out along the #2 shear zone, so as to collect representative samples and to properly understand both gold distribution through the mineralized zone and potential geological controls of the mineralization. The #2 shear zone is a northeast to southwest trending shear zone that reveals a near vertical dip and has been filled with quartz veining and associated alteration. The #2 shear zone is oriented sub-parallel to, the #1 shear zone, which occurs on the northwest side of the #2 shear zone. A section of the #2 shear zone totaling 12.1 m that was sampled repeatedly at surface produced an average grade of 6.5 g/t gold. This section included the area tested by blasts 5 and 6. A plan map describing the blast locations, lengths of vein tested, and gold assays can be seen in the image provided. All blasting was continuous along the vein structure, with the exception of a gap of 10.6 m to the south-west of blast 3 (between blast 2 and blast 3), which was not blasted or sampled because of a sharp dip in bedrock topography below extreme overburden. This dip in bedrock topography coincides with a north-south trending fault zone detected in the blasting work. Manitou deduces the higher grade shoots of mineralization sampled at the surface to be plunging southwesterly along the #2 shear zone. This observation is a good fit when modeling historic drilling results with the latest observations and interpretations as it improves the company’s continuing and future modeling for exploration drilling. The further identification and recognition of fault structures that intersect the #2 shear zone between blast 2 and blast 3 are of great significance. These north-trending faults can play a crucial role in controlling gold mineralization. The present drill program is testing for gold mineralization related to similar structures on both the #1 and #2 shear zones. Manitou has also lately received the results of the first hole from its recently commenced drill program at Kenwest. Hole KW-18-01 intersected the #2 shear zone approximately 50 m southwest of, and 30 m below, the face of blast #1. The intercept of hole KW-18-01 returned a length weighted intersection of 6.0 g/t gold across 2.5 m (estimated the true width of 1.8 m). This area is corresponding with the postulated southwesterly plunging mineralized trends within the #2 shear zone. The continuing drill program will pursue testing this model. We are pleased to see the return of higher grade assays for a large part of our initial sampling at the surface along the #2 vein. The information we have gathered and the interpretations we have made have helped us in executing a very effective exploration drilling program, which is well underway. I am particularly encouraged by the approximately 40 pounds of gold-bearing rock samples collected from the surface blasting. These samples, which were not included in the assay determinations, provide the Company with ample visual specimens of the gold contained in the # 2 vein at Kenwest. I look forward to the ongoing drilling program, which is continuing to test the theories developed as part of the surface work. As formerly announced, Manitou is presently undertaking an exploration drilling campaign at Kenwest. A total of 1,800 m of drilling across 15 holes are planned. The first four drill holes were finished to test the #2 shear zone and confirm the structural observations proposed herein. 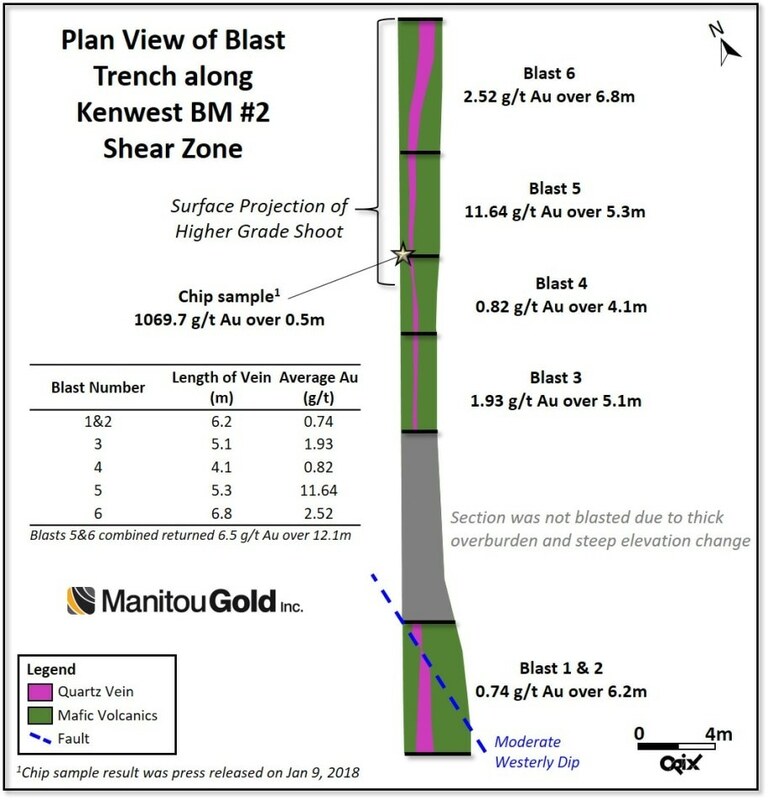 Eleven further holes will test the #1 shear zone in areas that the Manitou team has deduced as fitting the high-grade shoot model, making them exceptional exploration targets to further test the exploration proposition of southwesterly trending down plunge mineralization. These areas have had minimal past exploration and cover an area spanning approximately 600 m along the strike of the #1 shear zone. So far, six holes of the current drill program have been concluded, with five of them anticipating assay results. Visible gold was detected in holes KW-18-03 and KW-18-06.